Want to learn how you can avoid deadlocks in Java? 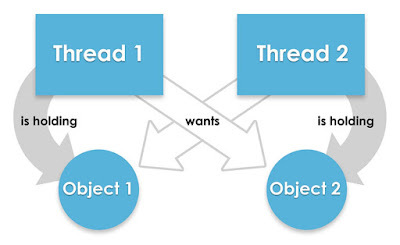 Check out this post to learn more about the conditions for creating a deadlock in Java threads. Want to learn how to avoid deadlock in Java? The question of avoiding deadlock is one of the popular Java interview questions, with multi-threading being asked mostly at a senior level interview with lots of follow up questions. Even though the question looks very basic, most of the Java developers get stuck once you start going deeper. So, what is a deadlock? The answer is simple — when two or more threads are waiting for each other to release the resource they need (lock) and get stuck for infinite time, the situation is called deadlock. It will only happen in the case of multitasking or multi-threading. How Do you Detect Deadlock in Java? Though this could have many answers, first, I would look at the code to see if a nested synchronized block is calling a synchronized method from another or if it is trying to get a lock on a different object. If that is the case, there is a good chance of deadlock, if the developer is not careful. Another way to determine deadlock risks is when you actually get dead-locked while running the application. If this happens, try to take a thread dump, in Linux you can do this by the command "kill -3." This will print the status of all threads in an application log file, and you can see which thread is locked on which object. If you are interested in learning about troubleshooting tools and the process to analyzing your thread dump, I suggest you take a look at this Analyzing Java Thread Dumps course on Pluralsight by Uriah Levy. This is an advanced practice course to learn more about Java thread dump and familiarize you with other popular advanced troubleshooting tools. * Java program to create a deadlock by imposing circular wait. * Opposite order i.e. first Integer and then String. * and other holds Integer lock and they wait for each other, forever. You can see that Thread 1 wants the lock on Object 2, which is held by Thread 2, and Thread 2 wants a lock on Object 1, which is held by Thread 1. Since no thread is willing to give up, there is a deadlock and the Java program is stuck. If you have looked at the above code carefully, then you may have figured out that the real reason for deadlock is not multiple threads, but it is the way that they are requesting a lock. If you provide an ordered access, then the problem will be resolved. Here is my fixed version, which avoids deadlock by using a circular wait with no preemption. This is one of the four conditions needed for deadlock. * Both method are now requesting lock in same order, first Integer and then String. Now, there would not be any deadlock, because both methods are accessing a lock on the Integer and String class literal in the same order. So, if Thread A acquires a lock on the Integer object, Thread B will not proceed until Thread A releases the Integer lock. This is done in the same way Thread A will not be blocked, even if Thread B holds a String lock, because, now, Thread B will not expect Thread A to release an Integer lock to proceed any further.